Where are your employees on the Mental Health Continuum? Mental health can be a difficult concept to understand. If you have an employee who is suffering from the flu, or who is in a wheelchair, their illness is visible and typically easy to accommodate. With the flu, there’s sleep and medication. With a wheelchair, it’s accessibility. Mental health issues, however, are challenging to recognize, and if you’re not trained as a mental health professional, it can go completely unnoticed—especially in the workplace. Add to that stigmas often associated with mental health issues. Twenty per cent of Canadians will deal with a mental illness at some point in their lives, according to the Canadian Mental Health Association. But just because an employee is suffering from mental health issues, doesn’t mean they have a mental illness. Using the continuum is a good place to start, Di Giulio said, but it’s also important to appoint champions of mental health awareness within the organization. Familiarize yourselves with the signs of mental health issues: burnout, signs of depression, or signs of anxiety. Loretta Brill, CEO of NX Knowledge Corporation, added that managers shouldn’t be expected to act as a psychologist, only to recognize the signs and offer up support. One of the most important things that the continuum model shows is that mental health is not binary. 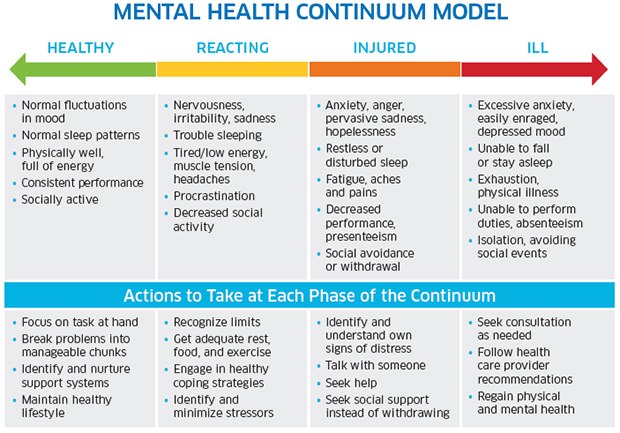 To help employers understand mental illness in the workplace, the Mental Health Commission of Canada developed a Mental Health Continuum model that illustrates the spectrum of symptoms people exhibit when dealing with mental health issues.